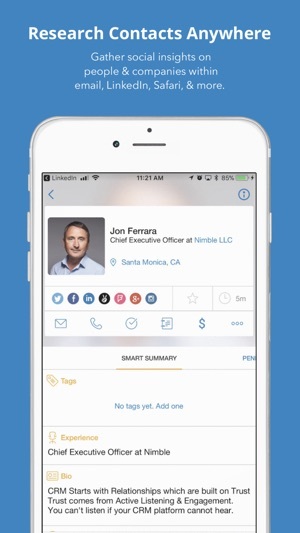 Nimble’s mobile CRM takes contacts from your address book, email, contacts, and calendar and combines them with your entire Nimble database into a unified relationship manager that delivers detailed dossiers on contacts you’re prospecting, qualifying, or meeting with today. 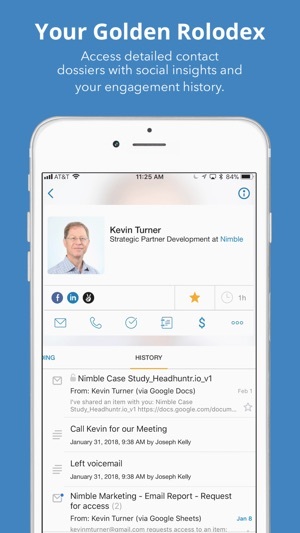 Nimble also enables you to follow up on conversations and follow through on projects as effectively and productively as you do while working on the go as in your office. 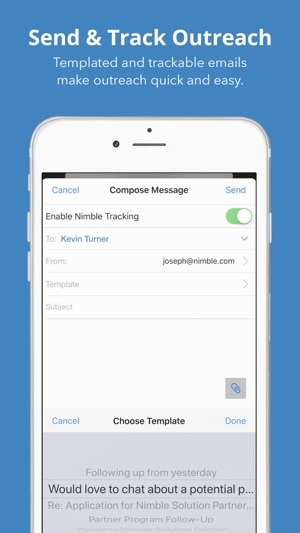 - Access to Nimble anywhere the iOS Share Menu is supported. Research contacts and companies from within email, contacts, calendar, LinkedIn, and Safari/Chrome. - Business card scanner which makes it easy to add new contacts with the snap of a photo. 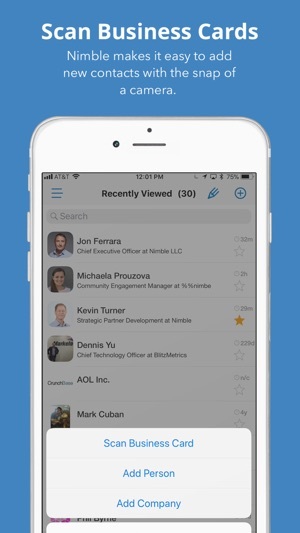 - Email and Twitter conversations are synced directly to mobile contact records. - Templated and trackable emails make outreach quick and easy. 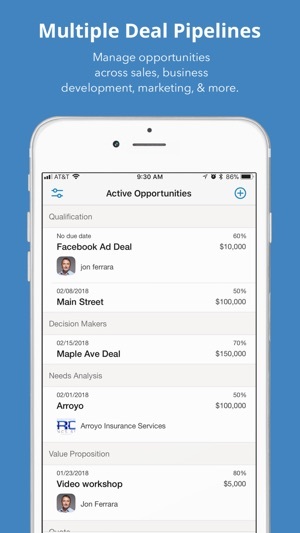 - Multiple pipeline manager helps you manage opportunities such as sales, renewals, business development, marketing, or PR. Questions or comments? Email us at care@nimble.com. We would love to hear from you. Thanks for using Nimble! We're bringing you regular updates and fixes to improve your Nimble mobile experience! As always, if you have any questions, send us a message at care@nimble.com and we'll be happy to help! I hope the Contact can show the relevant Projects that Contact is associated with. Right now, Contact doesn’t show that information on App version. I love the desktop version, the app had some issues but now it is working perfectly. I still hope the’ll improve the Mobil app even more!